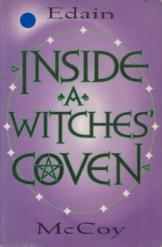 Inside a Witches' Coven by Edain McMcoy Sci Fi, book is in a very good condition, all pages intact. Edain McCoy, a self-initiated Witch, advises starting or joining a Wicca coven. The book includes information about finding, choosing, and gaining the greatest possible spiritual benefit from a new coven, from an experienced Witch.